Any kind of business runs based on the customer’s expectations. Customers are considered as the kings. All their needs, expectations and convenience about the product are fulfilled by the businessman. Sole proprietors are the people who take care of the reach of the product to the consumers. They play a very significant role in the society as the consumer needs are taken by them. Like for example, right from the food, cloth, medicinal requirements, to all stationery are reached to the consumers through sole proprietors. Even though there are many other ways for the goods to reach customers, sole proprietors or traders play a major role in development of the society. Here this post speaks about, what is sole proprietorship and what are the advantages and disadvantages of sole proprietorship business. A sole proprietorship is simply a business run by an individual without involving partners. In sole proprietorship, the individual who runs the business will take care of paying the income taxes and will follow some basic government rules and regulations. In a sole proprietorship, the individual who runs the business is responsible for profits, debts and liabilities. Here is the main job role of a sole proprietor. 1. A sole proprietor will take care of investing money in his business single hand or might acquire loan to run the business. 2. A sole proprietor will also maintain an inventory or a stock room to maintain his/her goods. 3. A sole proprietor will have to own a shop or rent a place in order to run the business. 4. A sole proprietor will take incharge of the customer complaints lodged against his/her goods when it is sold. 5. A sole proprietor will also see to that their employees work according to the business government laws and regulations. 6. A sole proprietor will also have a separate chartered accountant to maintain his/her financial accounts and see to it that the income tax is correctly filed and payed annually. 7. A sole proprietor will also take care of the payroll of the employees working under them. And will also maintain the records of the debts payed to a individual or any bank loans to run the business. 8. A sole proprietor will also act as business analyst and does research before buying goods from the new dealers, and also does research about new services for customers. 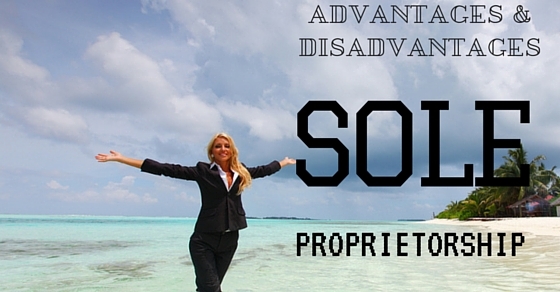 The following mentioned are some top advantages of soleproprietorship. Being a sole proprietor, has one big advantage of owning everything they gain to themselves. Right from the profits to credits, sole proprietor owns everything he gains out of the business. A sole proprietor has all the decision making power of the entire business and total control of the working model of the business. He/she does not have to report to the shareholder or board of directors about the working, pricing or selling of the product. Like any other corporate, a sole proprietor does not have to pay any kind of corporate taxes or pay business tax. A sole proprietor will only have to pay the sole proprietorship tax which is his income tax that is payed based on personal annual income. By this a sole proprietor has good huge exemptions which every corporate faces during the annual tax payments. Every corporate business has few methods of saving their entire business model in form of documents. A sole proprietor has full rights to maintain only things which he/she needs to run the business and not necessarily any kind of documenting procedures which corporates follow. There is no necessity of maintaining track sheets, or any payroll related documents or any records of the meetings conducted with the employees. Deadlines are always one of the pressurizing factors of working in a corporate. And when coming to sole proprietorship there is no time limit for any kind of business activities. Even though, there are few restrictions which has to be done in time to meet the customers, there is no particular schedules issued inside the organization to finish it in time. The sole proprietor is the only person responsible in fixing the time limit. In corporate, there are so many rules related to hiring process. For example, there are rules and regulations in which the corporate organizations can only hire during a particular period, and also there are so many restrictions in the number of count of the employees. In case of sole proprietorship, hiring process entirely depends on the sole proprietor and with no particular order he/she can hire number of employees they wanted to run the business. There are so many legal requirements faced by the corporate companies. And under the government of laws and regulations, a corporate is answerable to all kinds of legal compliance. A sole proprietor does not have any need to face these kind of laws and regulations nor pay any kind of filing fees. So, a sole proprietor is not answerable to anyone or no formal laws are applicable on their business. In case of serious losses or liabilities, a sole proprietor does not have to answer any individual or government regarding the outcome of the issue. A sole proprietor will be entirely responsible of the business profit or losses. In this case, a sole proprietor is entirely free from pressure faced due to the expectations of the market. In order to set or build an organization, a corporate has to spend lots on investment to meet the market standards or the competitors in the market. In the case of sole proprietor they have no particular way of running a business. The entire work setup does not require huge investment and also spending money depends purely on the sole proprietor. One more cost factor is getting license for running a business. For this matter, a sole proprietor has to obtain a one single license for running the business and it is not that costly. Overall, start-up costs very less compared to corporate. When sole proprietorship is considered, it is less complicated and can be formed easily than a formal corporation. As already mentioned, it is also cheaper. Double taxation standards are avoided in many states for sole proprietorship. The naming of the proprietorship can be done, can be achieved after the owner which improves business marketing. The key advantage of sole proprietorship is that they have unquestioned control over their firm. They will have complete rights to make all decision, staffing, marketing, pricing, expansion and more. There is also more flexibility and scheduling in this category of business. It is the entrepreneur or sole proprietorship who owns all risk and also risks all. At times of profit, the complete profit goes to the owner’s pocket. By this way the proprietor is motivated and dedicates himself completely so that he earns more profit. This presents that there is a direct relationship between effort and reward and thus business is managed more effectively and efficiently. The proprietor takes responsibility for each and every aspect of business and hence business secrets are maintained by him. There are also no legal requirements which insist him to publish his accounts and thus secrecy is maintained and the competitors are not provided with a chance to know any detail about their business. The following mentioned are few disadvantages of proprietorship and disadvantage of sole proprietor. Any kind of business might have both profit and losses going hand in hand. Being a sole proprietor sometimes might cause lots of mental difficulties when facing a loss. A sole proprietor is a person who is completely responsible for any kind of mishappenings in the business. Be it a complete loss or closing any particular division, a sole proprietor has to face the trouble. Sometimes taking all decisions single handed in a business might be difficult. For example, right from the choosing the traders to furniture to the shop, a sole proprietor will face difficulties and stress in making all decisions. Sometimes, this might also cause mental stress as every single thing of the business will be dependent on the proprietor’s decision. Any business with particular rules will have a format for operation of the business. When there is no particular kind of rules or regulations, there are chances of being lethargic in practicing a format. So, the business might not operate in full fledged mode as like the way corporate operates. Hence, sometimes a sole proprietorship can be dull in the way it operates than a corporate. Getting funds or angel investors are very difficult these days as there is no assurance for a successful business until they have a huge setup. So, a sole proprietor might find difficulties in getting an investor to run the business. This is a major sole proprietorship disadvantage. There are so many tax exemptions for people in corporate like tax exemption for health, educational purpose etc. This is not possible for a sole proprietor as he does not come under corporate regulations or any business regulations. Being a sole proprietor is like taking all the responsibilities. And a sole proprietor might have to work 24/7 to run their business successfully. Hence, they have a poor work life balance which is not at all times in corporate. For debts, losses and violations that occur in business, the business owner is the only person responsible. For example if the business faces any debts, then it is the responsibility of the business owner to repay the debt from personal funds. There are also chances for the owner to be sued if any unlawful act is performed by the employees. This factor is different from corporations as they enjoy limited liability. When the owner is incapacitated or deceased then there would be lack of continuity in business in sole proprietorship. If the owner dies, the business is liquidated and adds to a part of the owner’s estate which is distributed to beneficiaries. By this way the beneficiaries face lot of hassles and tax consequences which are inheritance and estate taxes. The owner is the one who offers initial capital and it can be quite difficult to generate capital in sole proprietorship business. This category of business do not follow any issue of stocks or other money generating ideas as followed by other corporations and hence raising capital is quite tough. The managerial skills for modern business would be updated and skilled. Every aspect of business requires these skills for their activities. A single individual in a single proprietorship would not possess all the managerial talents required to run the business. The limited financial talents for sole proprietorship would also be a hindrance to hire managers and other staffs and hence the growth of business is limited. The limited managerial capability, financial resources, and risk with private property makes sole proprietorship unfit for large scale operation. This system of business is thus not afforded for large scale operation. Most of the business forms have certain ups and downs. Be it a corporate governing or a sole proprietor, it itself has its own advantages as well as disadvantages. The above mentioned are single proprietorship advantages and disadvantages. A sole proprietor is the backbone of social welfare as it runs truly based on the customer critics and their expectations. As it is built on customer expectations and needs, it is the most successful method of running a business and as well sometimes risky too. Hence, considering the whole sole proprietorship advantage and disadvantages one has to choose their business mode of operation. Hope this post helps in understanding the entire terminology of sole proprietorship and the sole proprietorship pros and cons.